Our superior methods of printing means every one of our flags are manufactured to the highest standard. Each advertising flag is water-base digitally dye printed in full color, resulting in excellent color matching and deep, rich color contrasts. Place your marketing message front and center with our mini flags.This flag fits our mini fiberglass flag pole. 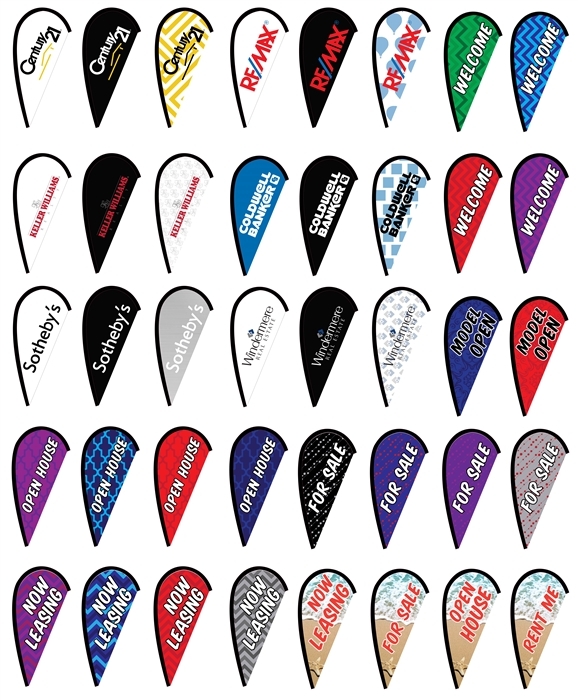 The teardrop flag size is 25" x 7.12" and stands 32" tall.Available in either one or two sided custom printing, these ADJUSTABLE mini teardrop flags are sure to get your business increased attention by your potential customer. Stock real estate flags available are: Century 21 on white, Century 21 on black, Century 21 on design, Remax on white, Remax on black, Remax on design, Keller Williams on white, Keller Williams on black, Keller Williams on design, Coldwell Banker on blue, Coldwell Banker on black, Coldwell Banker on design, Sotheby's on white, Sotheby's on black, Sotheby's on grey, Windermere Real Estate on white, Windermere Real Estate on black, Windermere Real Estate on design, Open House on purple design, Open House on blue/light blue design, Open House on red design, Open House on blue design, For Sale on black design, For Sale on blue design, For Sale on purple design, For Sale on grey design, Now Leasing on purple design, Now Leasing on blue design, Now Leasing on red design, Now Leasing on grey design, Welcome on green design, Welcome on blue design, Welcome on red design, Welcome on purple design, Model Open on blue design, Model Open on red design, Now Leasing on beach design, For Sale on beach design, Open House on beach design, and Rent Me on beach design. This is a unique way to display your real estate company!! 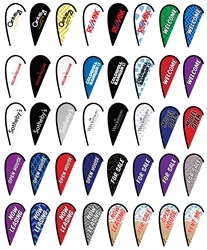 Get your mini teardrop flag kit today!! Teardrop flag size: 25" X 7.12" standing tall at 32"